The Scottish Marching Ghillie Brogue Shoes are made for extended wear for pipers and bagpipe band menbers. Synthetic Sole. Available in US Mens Sizes 5-14. 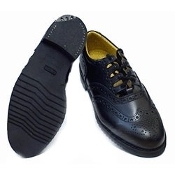 The Piper is an exceptionally comfortable ghillie brogue for marching and performances. The shoe features a heavy premium grade leather upper, a padded top line, a full length, high density cushioned insole, a hard-wearing rubber sole, and a metal heel cleat. This is a modern revolution in traditional dress. Please allow 2-3 weeks for delivery or call 800-636-0116 for availability.